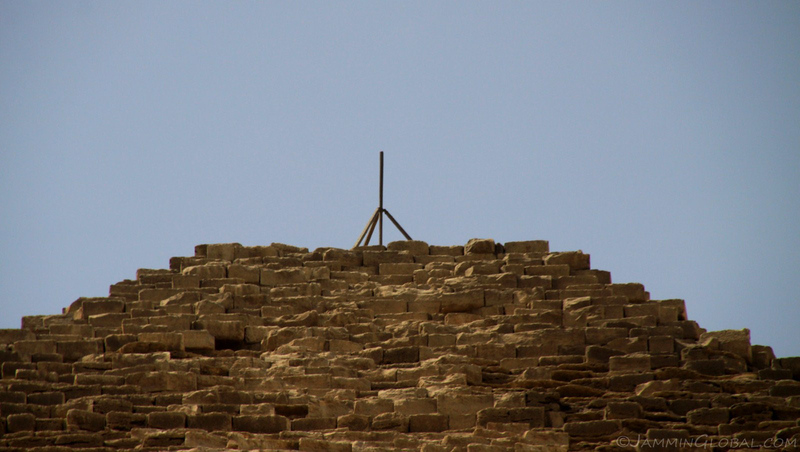 The top of Khufu’s Pyramid with its peak missing. Just so that the Great Pyramid remains the tallest pyramid, they’ve put that wooden structure on top, nudging nearby Khafre’s pyramid to second tallest structure around. 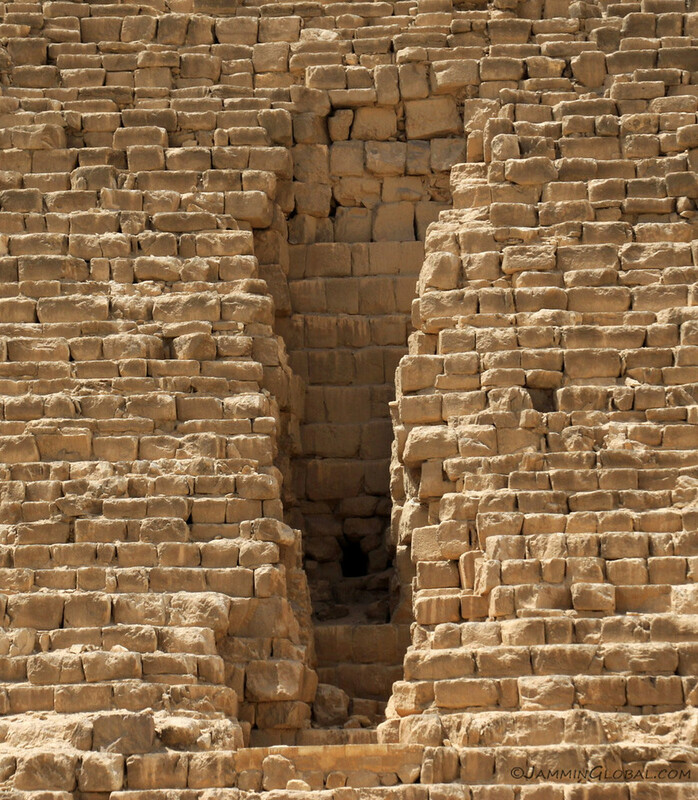 A notch in the northeastern crease of the pyramid, which some Egyptologists have suggested reveals a possible construction method of the pyramid. 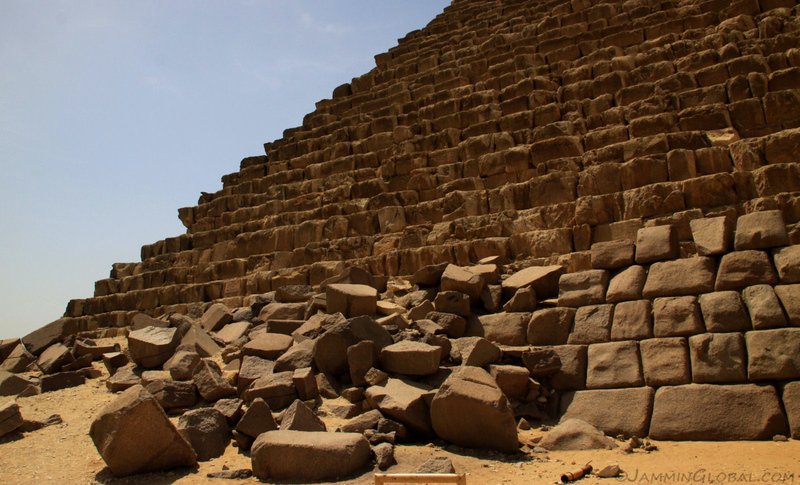 It still hasn’t been settled how exactly the pyramids were built with the popular one being a huge ramp to slide the rocks up, but building the ramp would’ve taken as much time and stones as the pyramid. 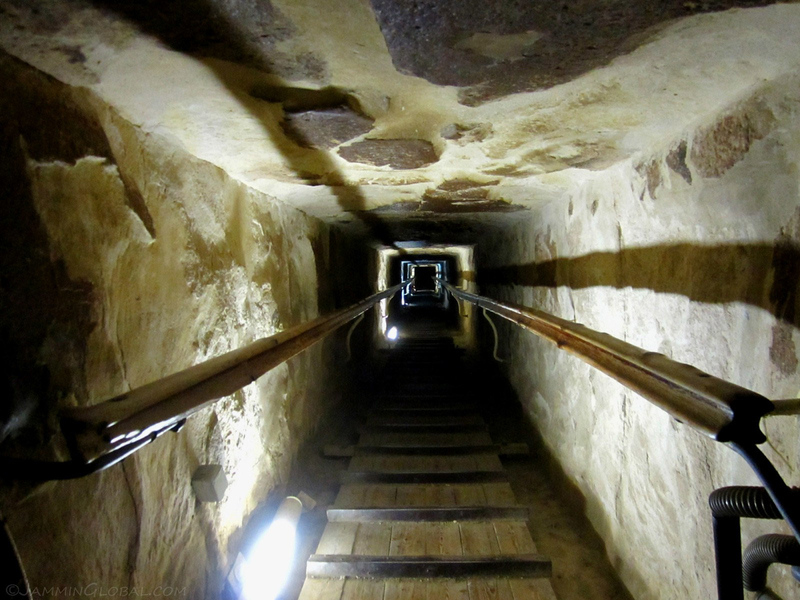 From exploring the notch, an idea has come up that the pyramids had concentrically-rising corridors near its exterior that acted as a ramp for the blocks. 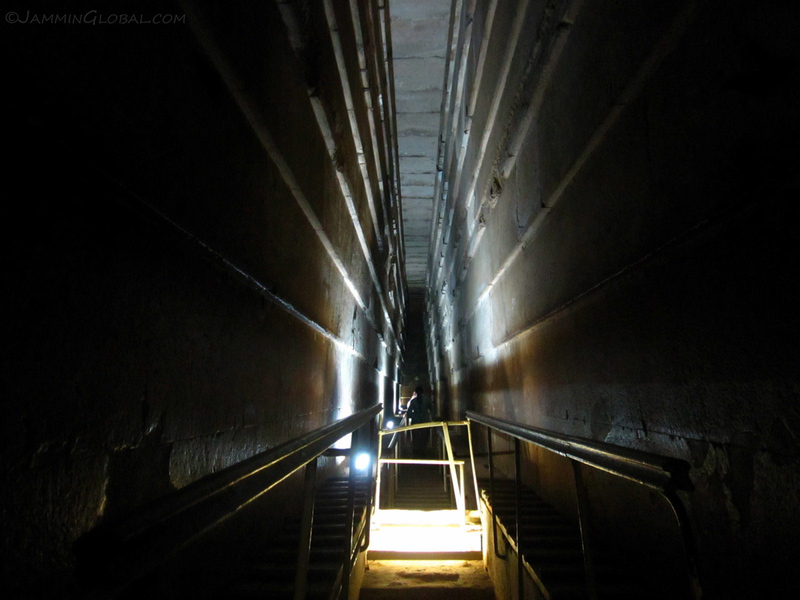 And now for a tour inside the Great Pyramid. This entrance is known as the Robbers’ Tunnel and was dug out in AD 820 by Caliph al-Ma’mun who wanted to plunder the treasures inside. It’s narrow and slanted and not for claustrophics. At the top of the tunnel, I entered into the Grand Gallery, which leads to the King’s Chamber. The gallery is about 47 m (153 ft) long with a roof 8.60 m (28 ft) high. It was fantastic to see such a huge void knowing that I was surrounded by a massive quantity of rock all around. 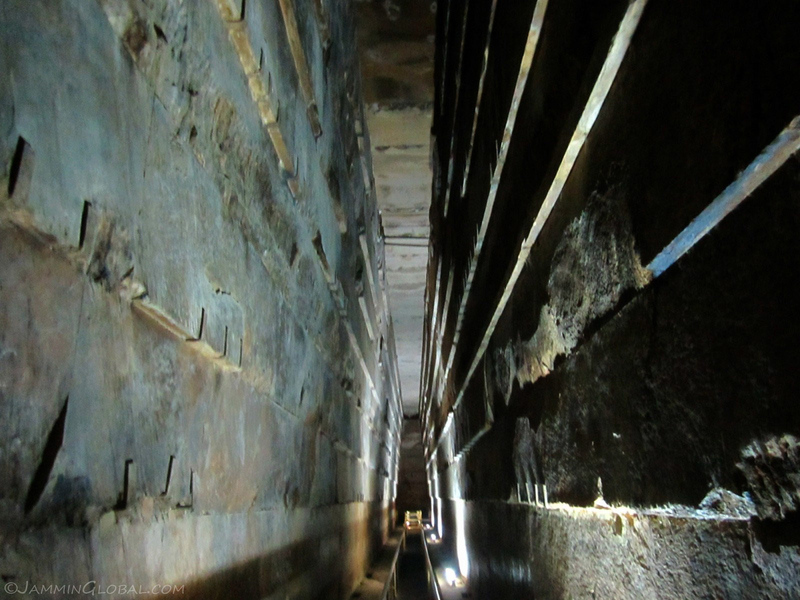 Notches running up the gallery that an Egyptologist has theorized were used in ratcheting in place the granite slabs for the burial chamber ahead. Looking down the entire length of the Grand Gallery, the way I came up. You can see that the gallery narrows towards the roof. This was so that the walls would support the weight of the stones of top of the gallery. 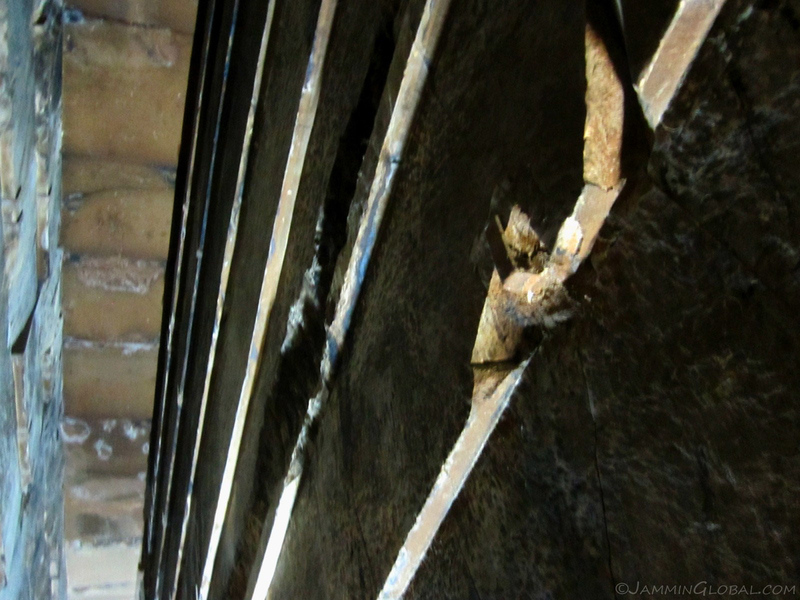 The sharp cut edges of granite blocks in the Grand Gallery. 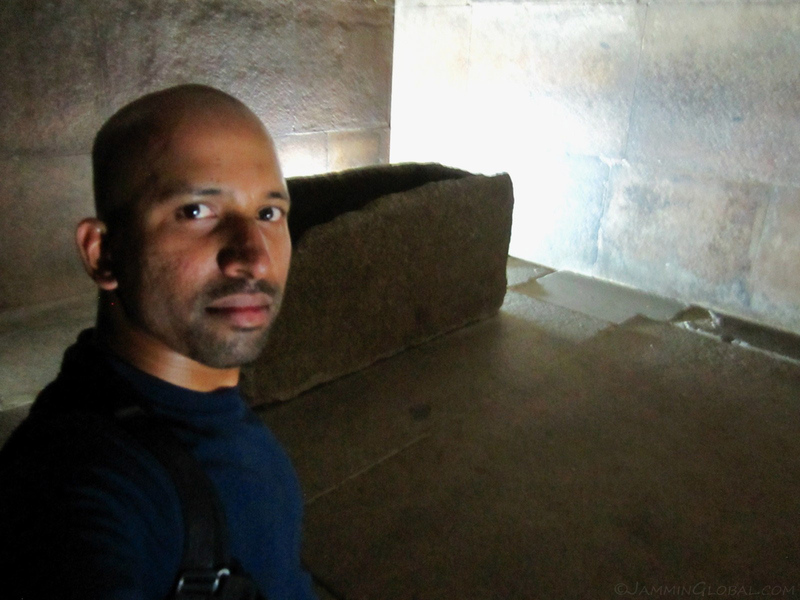 After crawling through another short tunnel, I emerged in the King’s Chamber, the focus of the pyramid. 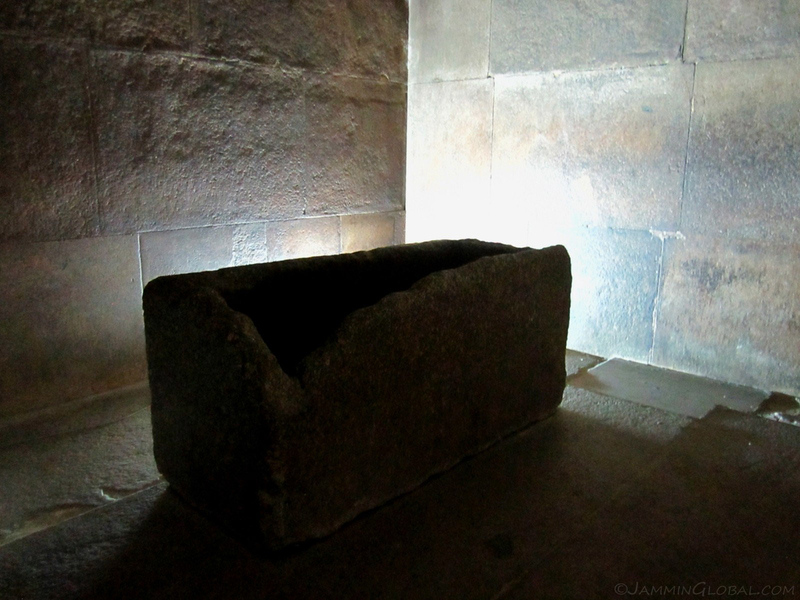 Today it’s an empty room about 10 m (33 ft) by 5 m (17) with a roof 6 m (20 ft) high with the only object being this sarcophagus. It’s quite roughly finished with suggestions that the original fancy granite one was lost in the Nile during transport and this replacement one was put together quickly. Egyptologists have suggested this because they’ve found very ornately decorated sarcophagi in other less grand pyramids. 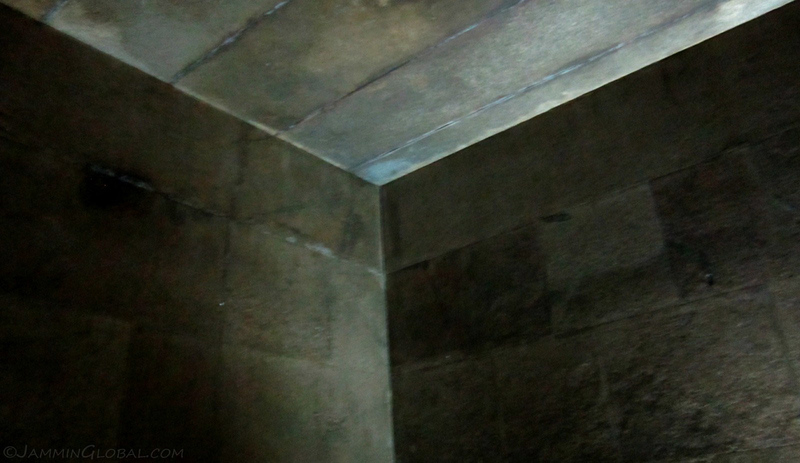 One corner of the King’s Chamber. The whole room is made of granite blocks that were quarried in Aswan and floated down the Nile. Besides the feat of transporting and placing such huge and heavy blocks of granite 4,500 years ago, what’s even more impressive to me are the precision cuts that they were able to make in granite, one of the toughest stones on Earth. 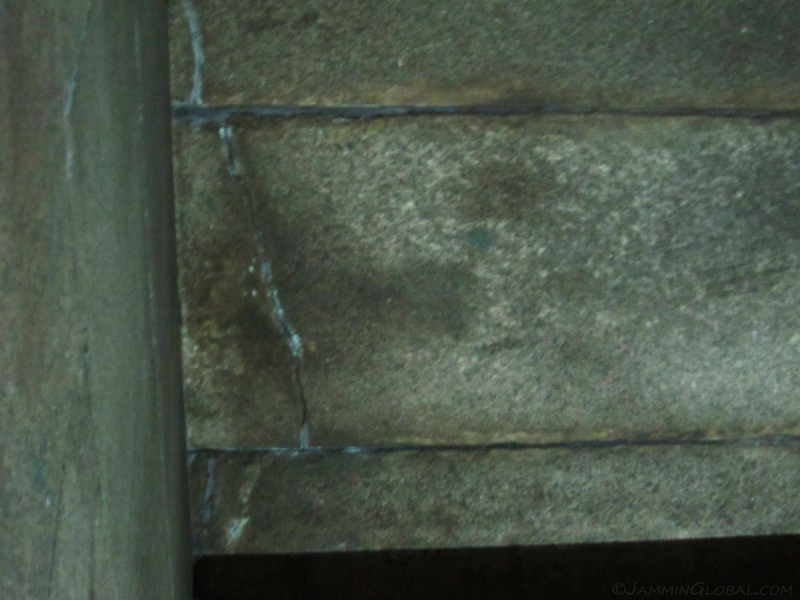 At another corner in the King’s Chamber, some cracks in the granite are visible, along with patch work done by the Antiquities department. It’s been deduced that the granite was cut by the original masons by first finding natural cracks in the rock into which wooden wedges were inserted. Water was then poured on the wedges, which after absorbing the water would expand and further crack the rock. Then, there was lots and lots of polishing to get the smooth finish, but still, getting sharp edges seems quite the feat. 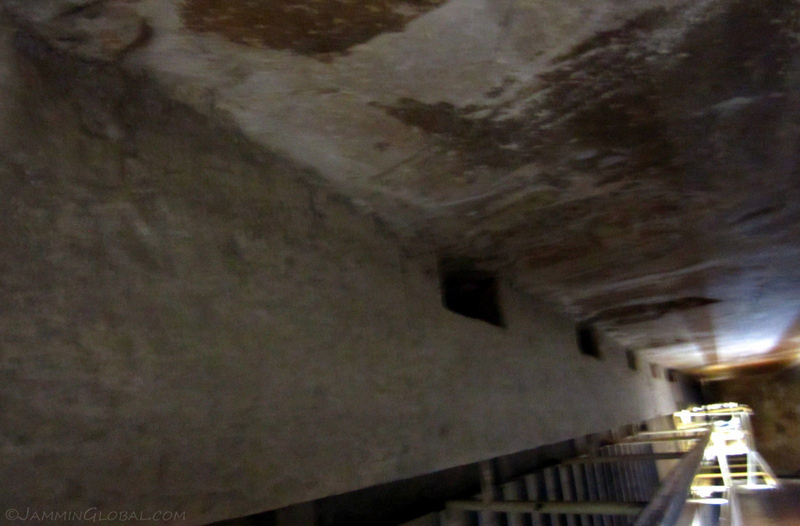 I had good timing with my visit to the interior of the Great Pyramid as just as I entered a group of Polish tourists left and then there was no one else there for the next 20 minutes. 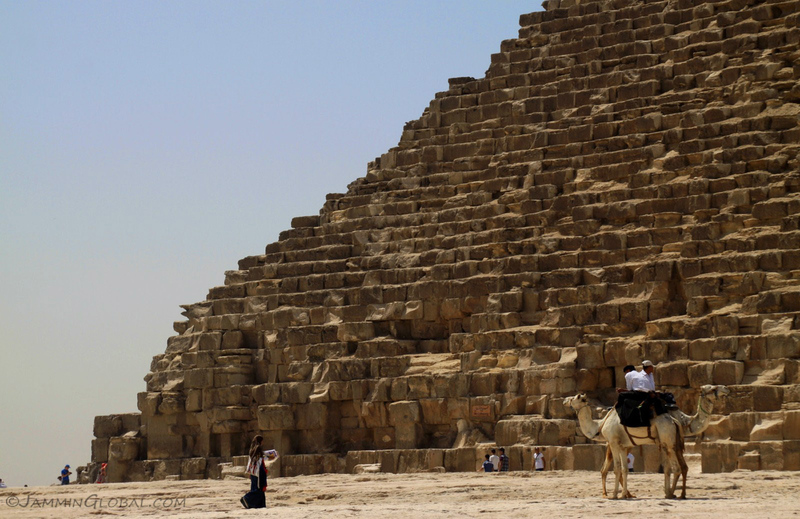 I tried to imagine what would drive a man (Pharaoh Khufu) to dedicate his whole life to building such a grand structure and having the power and will to employ the tens of thousands of workers it took to erect this nearly eternal monument to himself. Grooves cut in the stone above the entrance to the King’s Chamber, probably used as a locking device. Well, that didn’t work too well as it’s been suggested that the treasure was stolen within a few years or few hundred of the pyramid’s completion. Back outside in the blazing sun and getting a shot for perspective on how huge the blocks of limestone are. 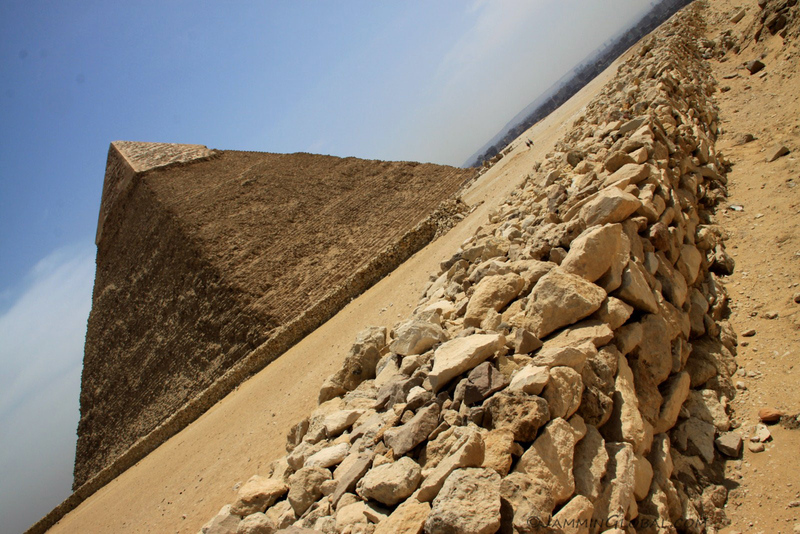 The Great Pyramid is so massive that two corners of it merge into a straight line with the apex in the middle. It was only 9:30 in the morning, but the sun was already high in the sky. Avenue of giants. Having my own transport meant that I could ride around the complex freely. This is the road heading toward the second pyramid on the right, with the Great Pyramid on my left. 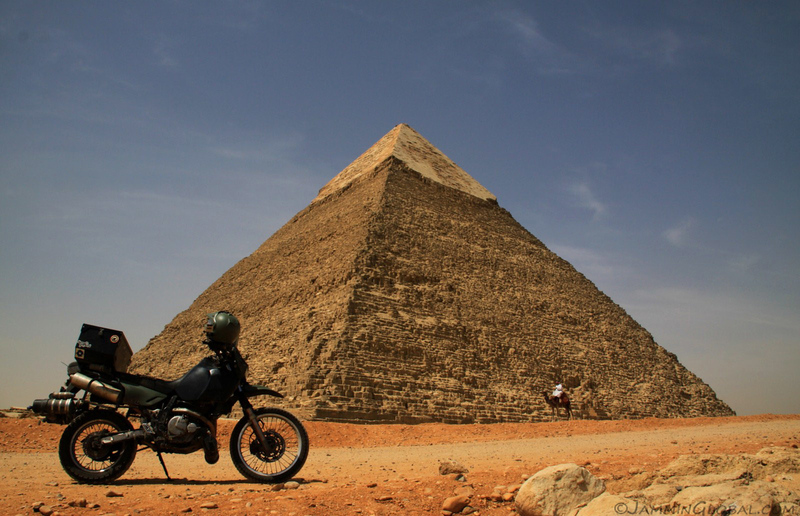 sanDRina and the Pyramid of Khafre (or Chefren), who’s father was Pharaoh Khufu. 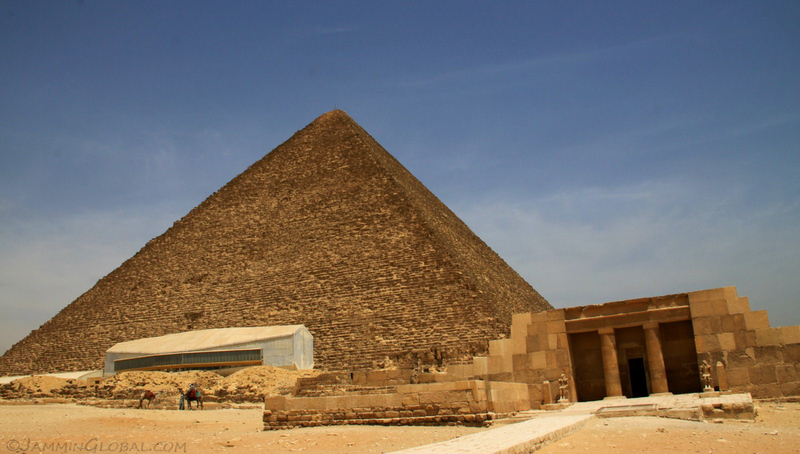 Out of respect or decree, he couldn’t build a taller pyramid that his father’s but just to spite him, Khafre built his on bedrock that’s 10 m higher, so his pyramid appears taller than his dad’s. That family must’ve had some power issues. 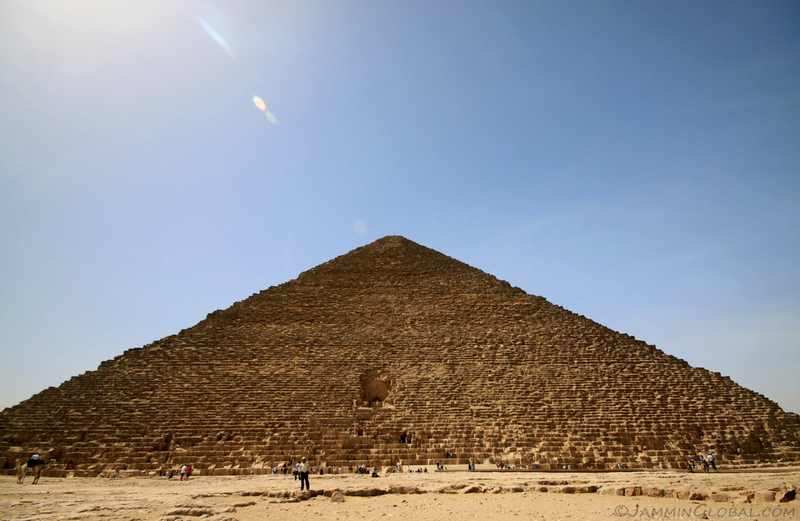 So, Khafre’s Pyramid is 136 m (448 ft) tall with a base running 215 m (705 ft) on each side. 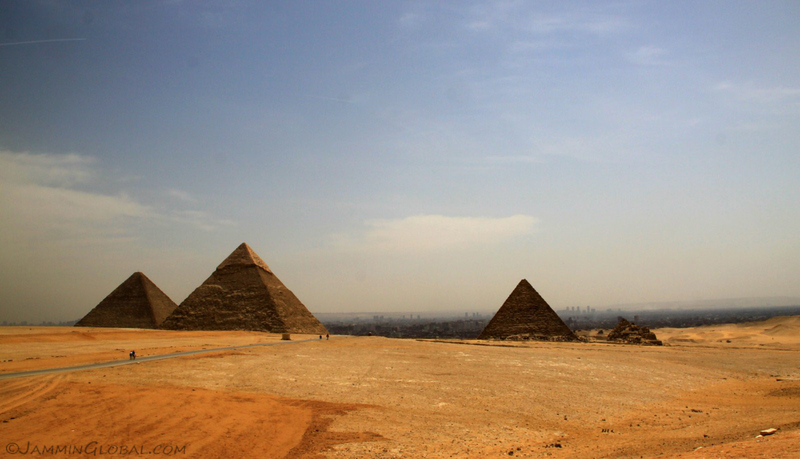 South, behind Khafre’s Pyramid is the third pyramid of Giza, that of Pharaoh Menkaure. It looks smaller and it is much smaller. The site for Khafre’s Pyramid was inclined ground, compared to the relatively flat area chosen for Khufu’s. This required cutting into the bedrock on the northwestern corner of Khafre’s site, pictured on the right. The Pyramid of Menkaure with its signature s-shaped gash and a camel. This pyramid is the only one with any semblance of how it actually looked when it was finished. 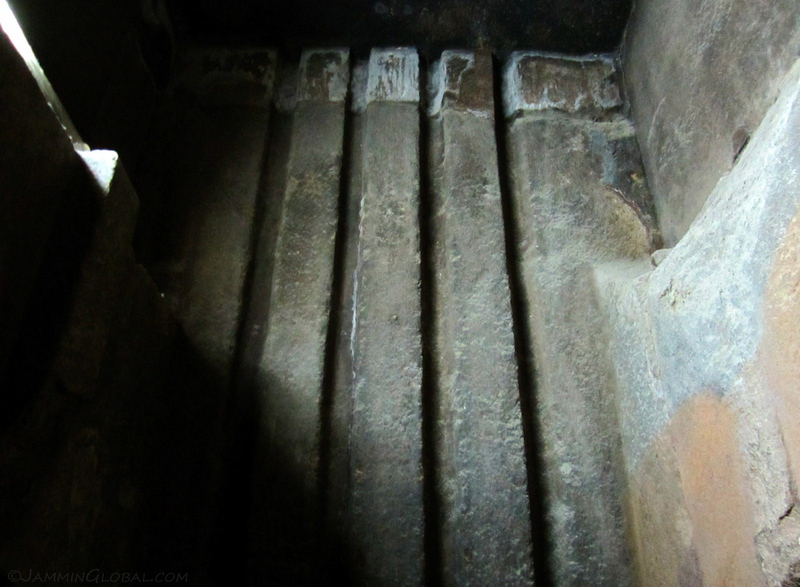 The bottom fifth is covered in granite casing stones, which remain to this day. Above that, polished limestone was used, which either weathered away or was removed through the ages for other construction projects. Being smaller in size compared to its more grand neighbors doesn’t diminish the stature of Menkaure’s Pyramid as he made up for it in quality. 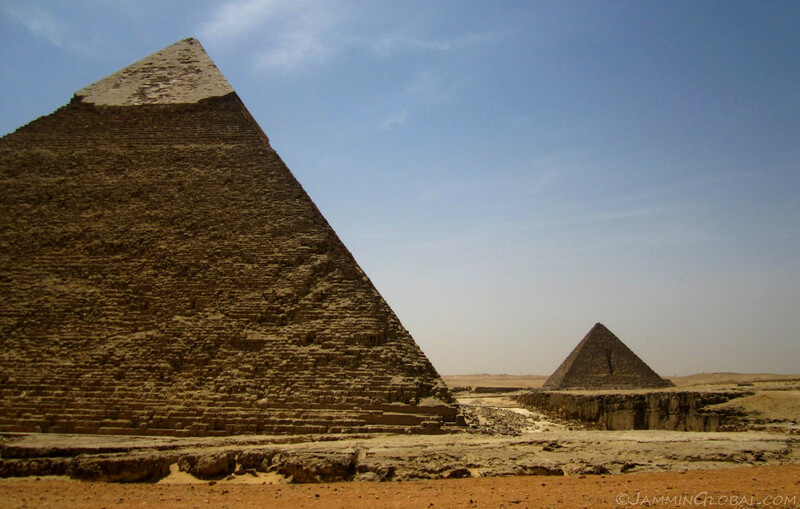 The two larger pyramids used polished limestone for their casing, which is not present any more, while Menkaure used pink granite for the first 16 courses around his pyramid. Using granite for the casing stones was very expensive, as it had to come all the way from Aswan, while all the limestone came from nearby quarries. 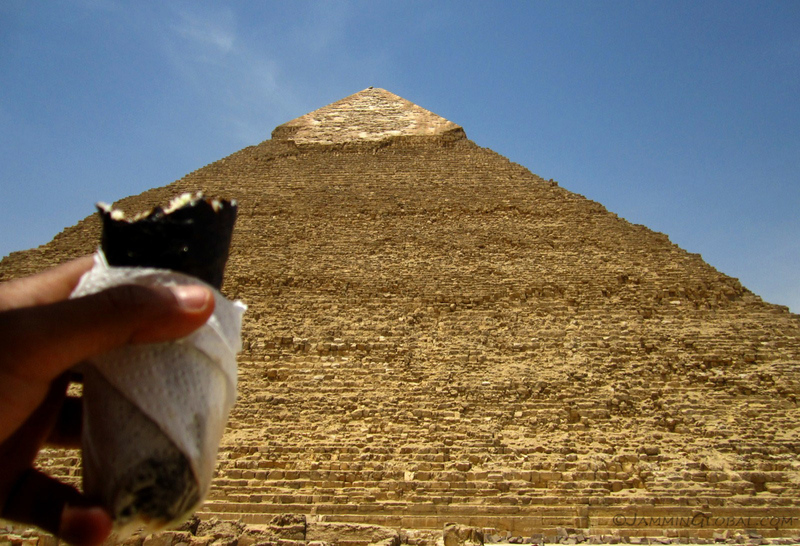 The Pyramid of Menkaure with its still intact granite casing stones on the bottom and its exposed core that was covered in polished limestone. Some limestone casing stones are thought to have fallen down through the ages due to seismic activity, but most of it was removed by later rulers for the building of Cairo. This pyramid is 61 m (240 ft) tall with sides running 108 m (354 ft). 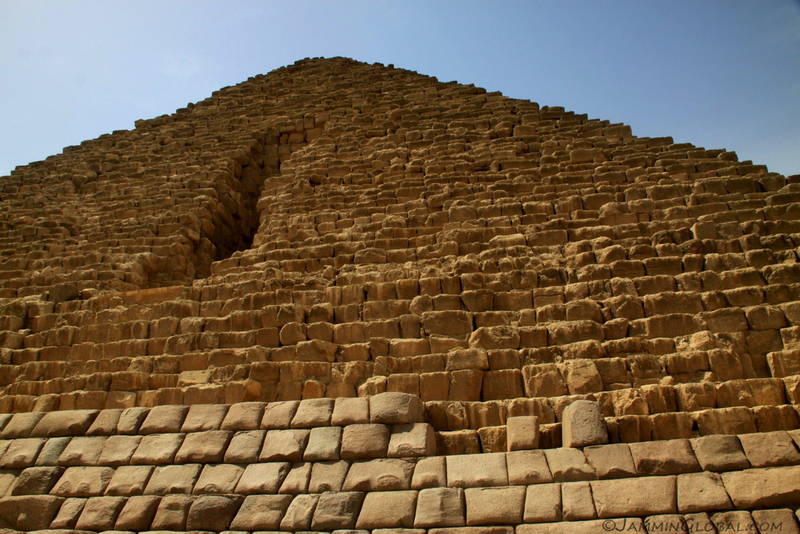 On the northern face of Menkaure’s Pyramid is the sad scar from an attempted demolition of the pyramids by Cairo’s rulers in the 12th century. Al-aziz Uthman, son of the great Saladin (who fought back against the crusaders), decided it was time to bring down the pyramids. After 8 months of removing stones, this is their futile result. They gave up as it was taking too much time and money. The pyramid workers were probably laughing in their nearby cemetery (the workers were buried near their king). I rode around the complex for some better views of these magnificent structures. Khafre’s Pyramid looking out over Cairo down below. 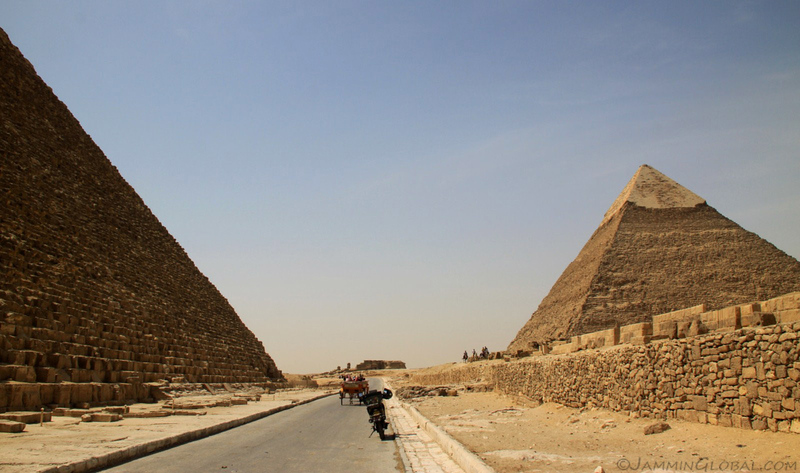 Khafre’s Pyramid appears taller than Khufu’s also because its sides are slightly steeper at 53°10′ compared to 51°50′. 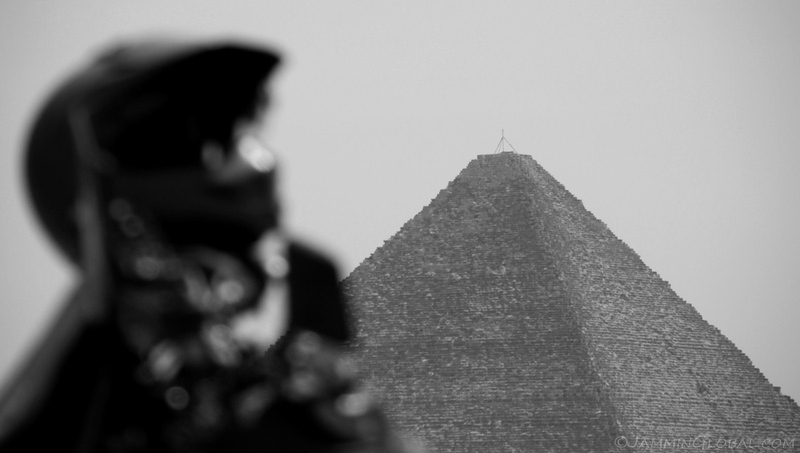 The Pyramid of Khafre with sanDRina in focus. She’s taken me to glaciers in Patagonia and now pyramids in the Sahara. 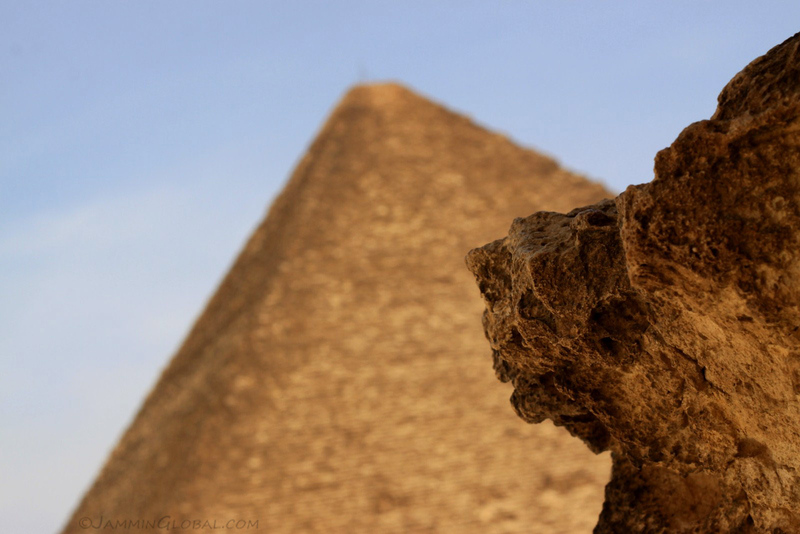 sanDRina with the Pyramid of Khufu in focus. At the western edge of the complex, I got this grand view of all the pyramids, who’ve been here on the Giza Plateau for about 4,570 years. That haze in the distance is Cairo, surrounding the Nile. From here I could see why they chose this site for the pyramids, giving them a height advantage for nearly four millennia. The Great Pyramid (far left) was the tallest man-made structure in the world until AD 1300, being surpassed by the Lincoln Cathedral in England. The south side of The Great Pyramid with Khufu’s Boat Museum in white. It houses one of many boats buried as a grave good for the pharaoh to use in the afterlife, sailing across the heavens with Ra, the sun god and thus these burial boats are known as solar barges. 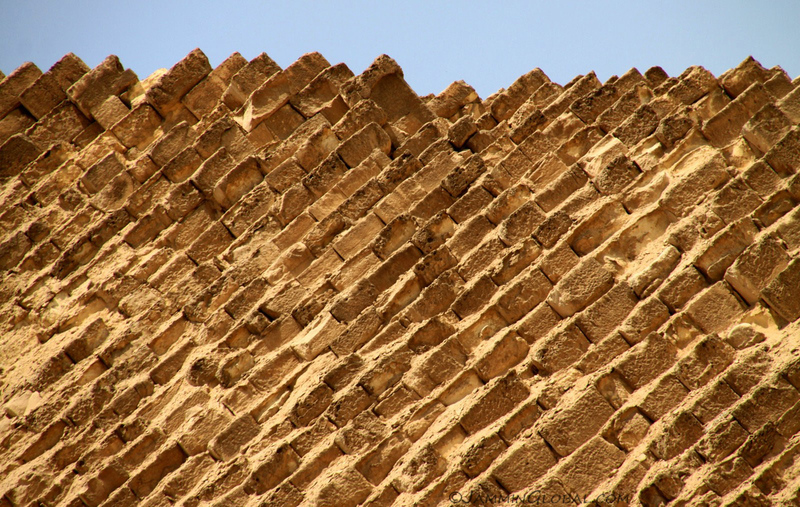 A close-up of the southeast corner of Khufu’s Pyramid. The blocks are much smaller closer to the top than the ones near the base. 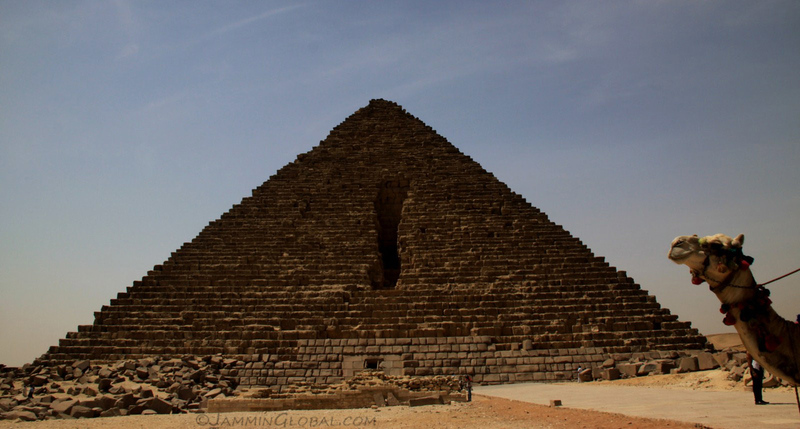 …Khafre’s Pyramid. Goes well with a sushi roll. I was staying with Ihab and he loves sushi. 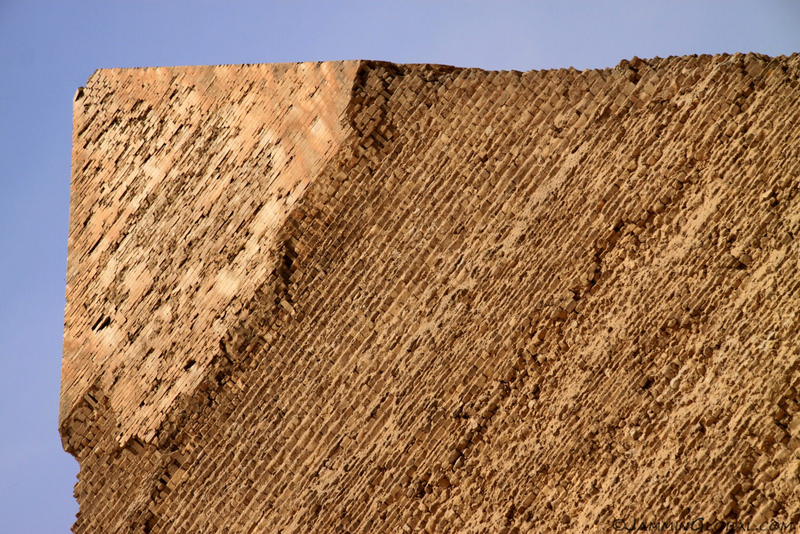 Detail of the limestone outcrop near the pyramids. Both the large pyramids are built on existing limestone outcrops so as to reduce the number of stones needed to build up the pyramid. 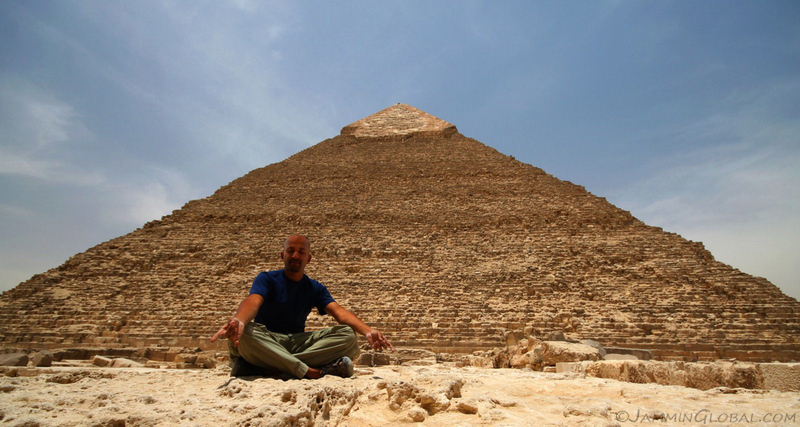 A little after-lunch meditation under the gaze of Khafre’s Pyramid. 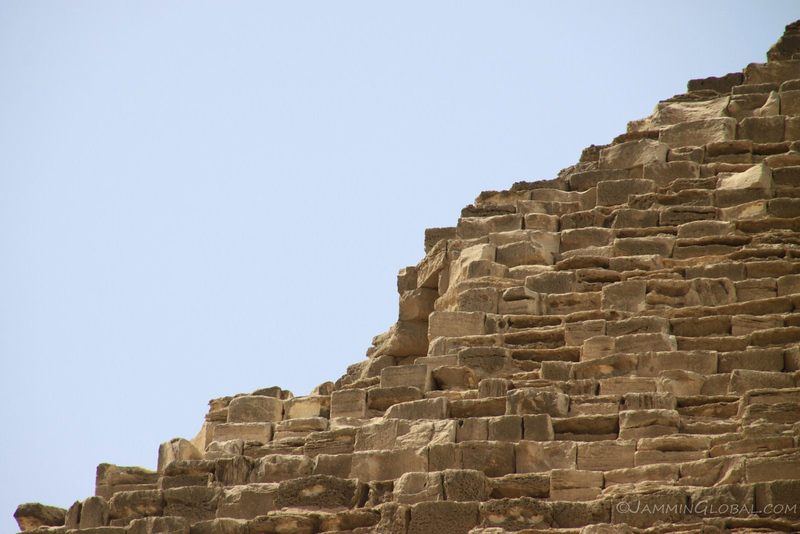 A close-up of the tip of Khafre’s Pyramid, which is the only pyramid around to retain some of its limestone casing stones, that too around its apex. I imagined what the pyramids must’ve looked like right after their construction, gleaming white in the desert sun. The Great Sphinx of Giza, a stone sculpture of a man’s head with a lion’s body. 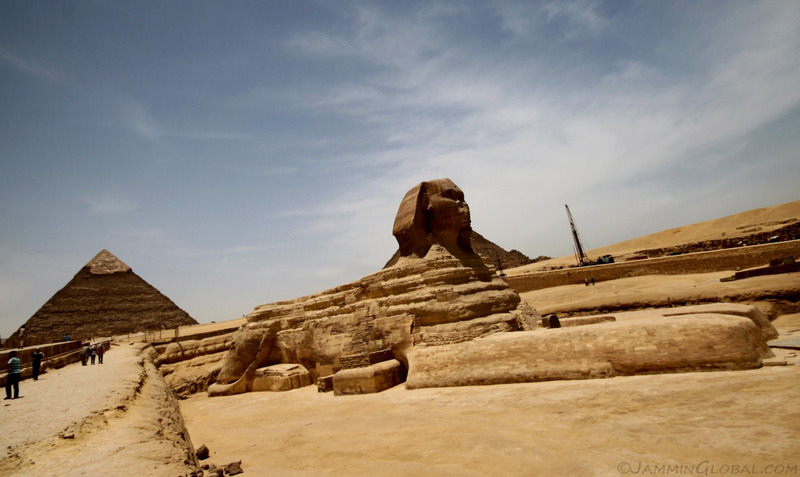 The Sphinx was carved from a single piece of limestone in situ and thus is the world’s largest monolith sculpture. Much mystery still surrounds the age, construction and purpose of the Sphinx. Seeing that it lies in front of Khafre’s Pyramid, he is accepted by mainstream Egyptologists as the creator. 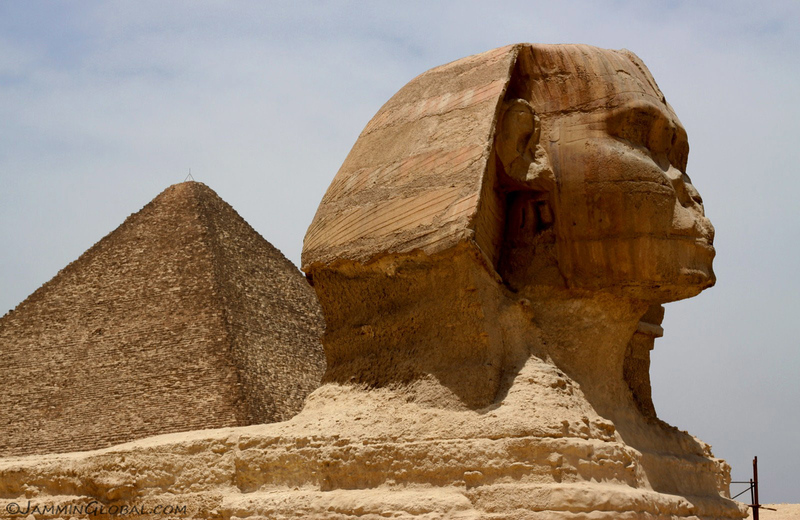 However, certain dating techniques by geologists put the Sphinx a few centuries before Khafre’s time. The giant paws of the Sphinx. The sculpture was buried up to its neck in sand until it got fully excavated in 1936. Bricks and limestone casing were used to shape the outer surface of the limestone core. The head of the Sphinx and Khufu’s Pyramid in the background. This shot makes the Sphinx appear quite large but actually the pyramid is quite a ways back and is just that much larger. 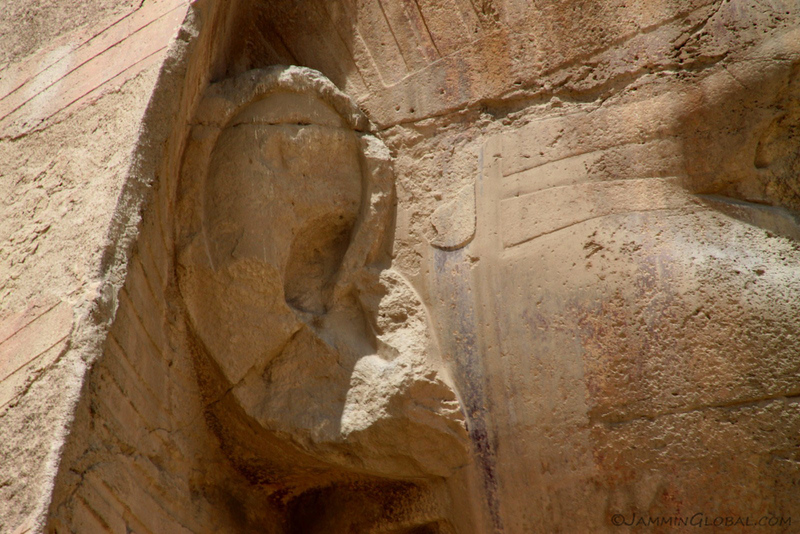 A close-up of the ear of the Sphinx and the texture of the surface, which has weathered sandstorms through the ages. 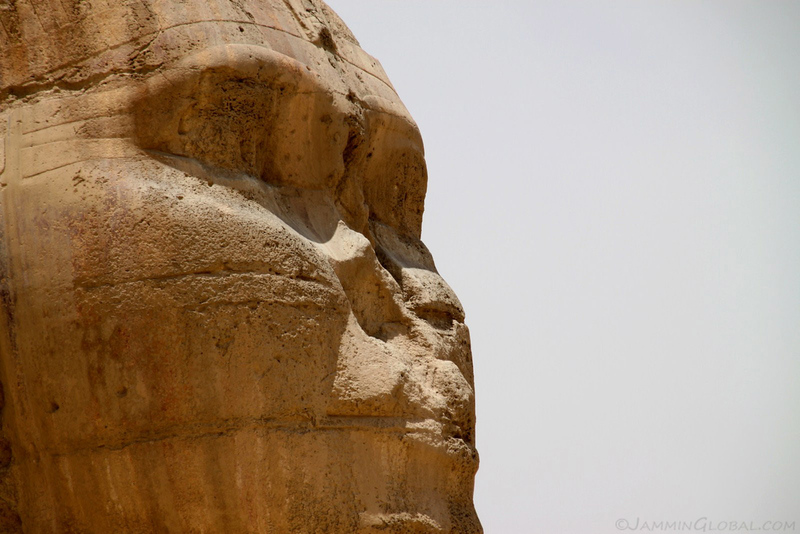 The face of the Sphinx with its missing nose and beard. The most likely story is that a certain devout Muslim, Muhammad Sa’im al-Dahr, was so enraged in AD 1378 when he found peasants giving offerings to the Sphinx in hopes of a good harvest that he climbed on top and broke off the nose. He paid the price by being hanged for vandalism. 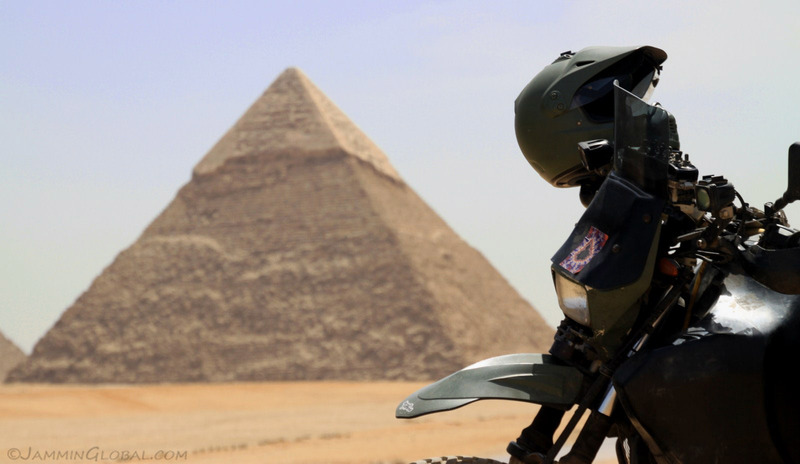 Other stories recall how Napoleon’s troops in the late 18th century used the Sphinx as target practice. The Sphinx and the Pyramid of Khafre, again much further in the background, making the Sphinx appear quite large. 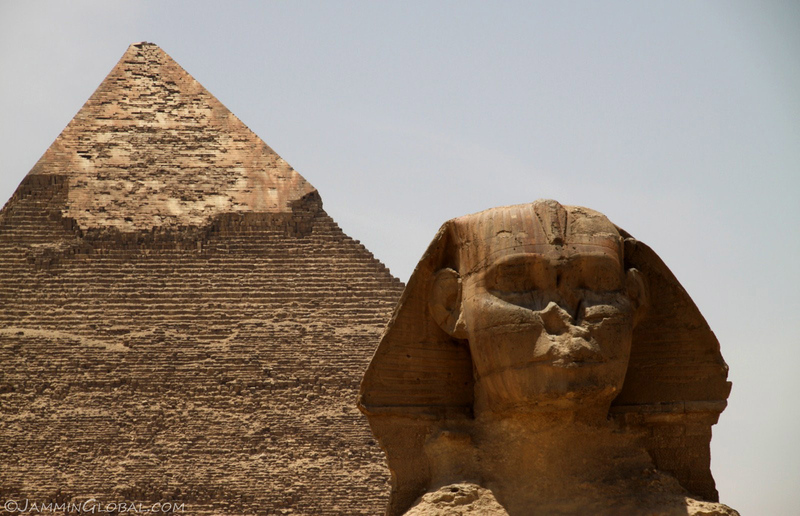 The face on the Sphinx has been attributed to that of Khafre’s and thus the mainstream acceptance that he was the creator. 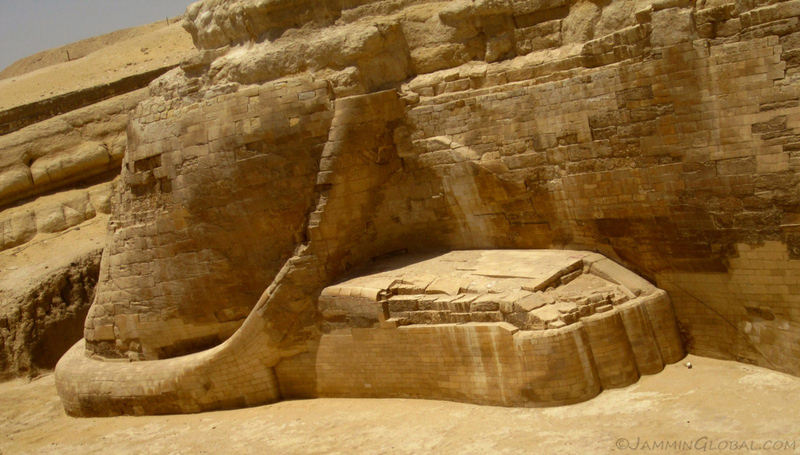 However, there are currently no inscriptions from the Old Kingdom (2686 BC – 2181 BC) that mentions the Sphinx unlike all the other monuments from this time period. My theory is that the limestone outcrop was carved by Aeolian (wind erosion) processes and a sculptor saw an animal form in the rock and became to shape it. To get the favor of his ruler at that time, he put his head on top of the sculpture. A wide shot showing Khafre’s Pyramid and the Sphinx with Khafre’s causeway and valley temple to the right of the Sphinx. Supporting the theory that the Sphinx was there much before the pyramids is the skewed angle of Khafre’s causeway to accommodate the Sphinx compared to the more straight causeways of the other pyramids. 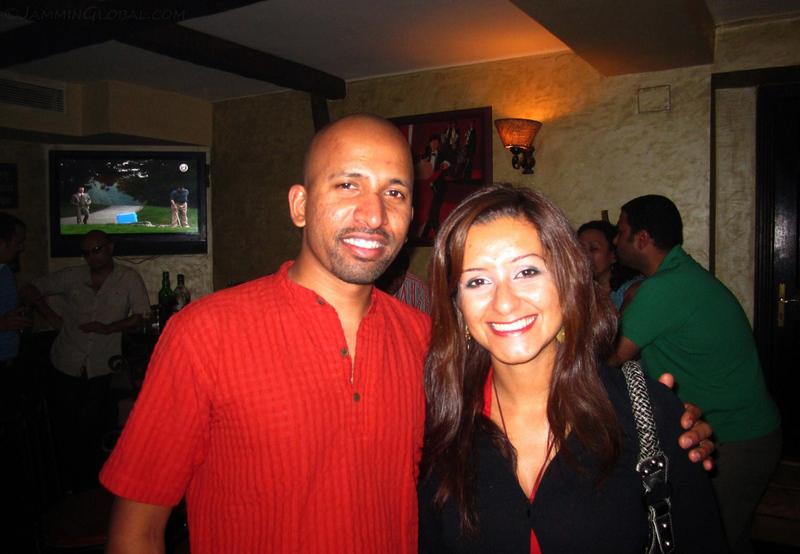 That night, I went out with Ihab, who I was staying with to Pub 55 in Maadi, a classic night club under a grand villa. 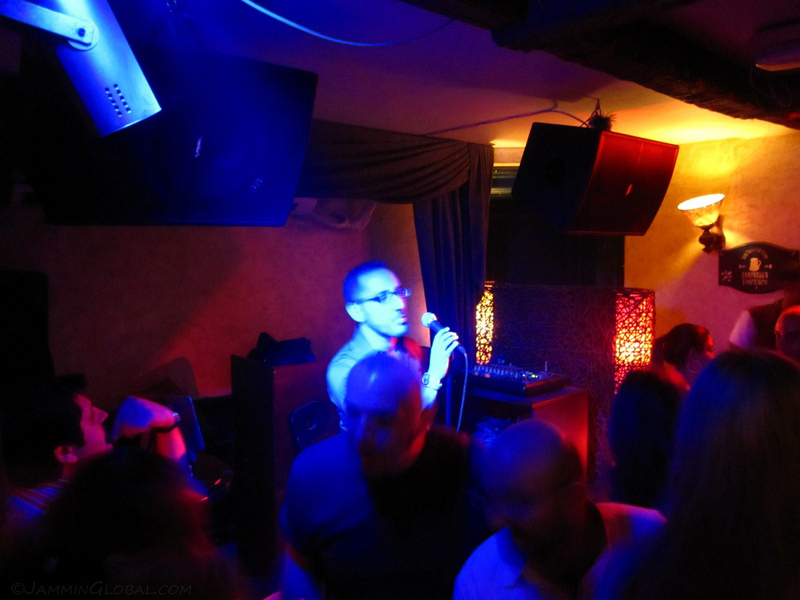 This singer was belting out the tunes and finished off with some Egyptian classics that had the whole place singing along. I chatted up Magda here who’s working in the IT sector and took part in the recent protests. 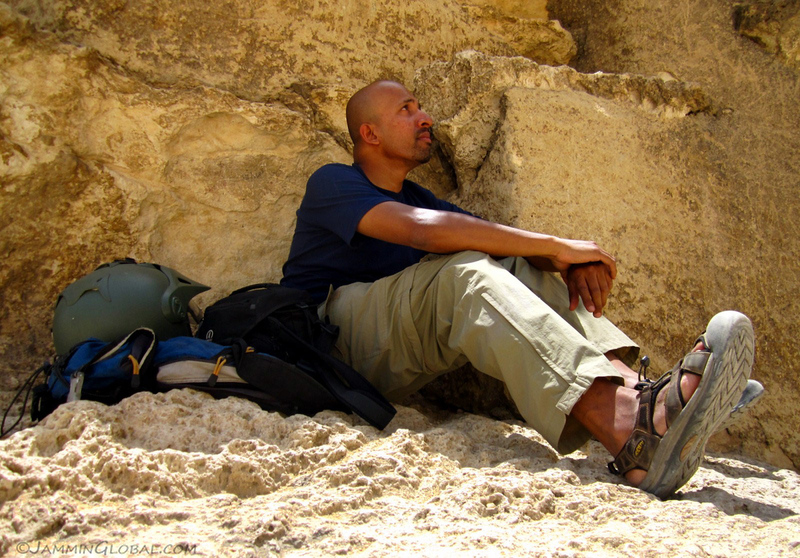 She said it was very brave of me to come to Egypt at this time, but I tried to reassure her that I didn’t feel any sense of danger here. In hindsight, I was lucky to pass through Egypt during a lull in protests as they picked up again towards the end of the year as the revolution continues to shape the New Egypt. 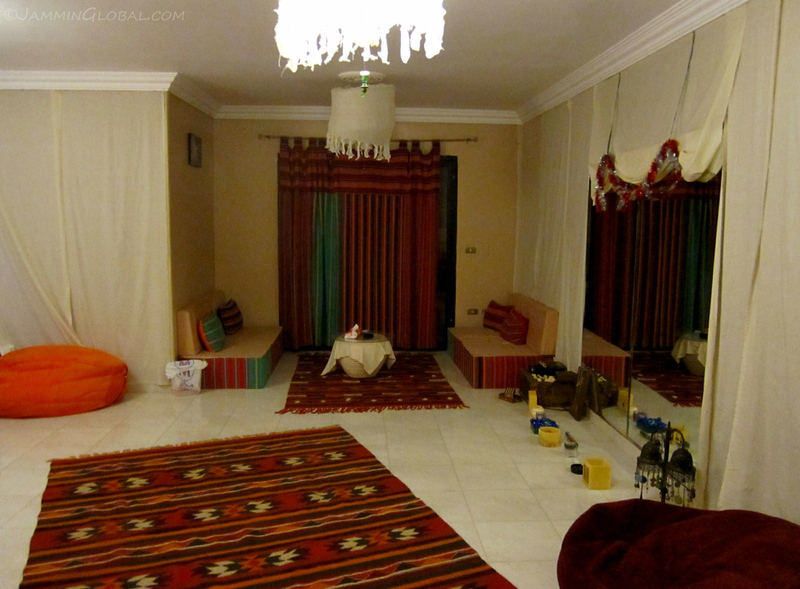 Ihab’s wonderfully decorated flat with traditional Egyptian touches. The drapes on the wall resembling a Bedouin tent with soft cushions to relax on. 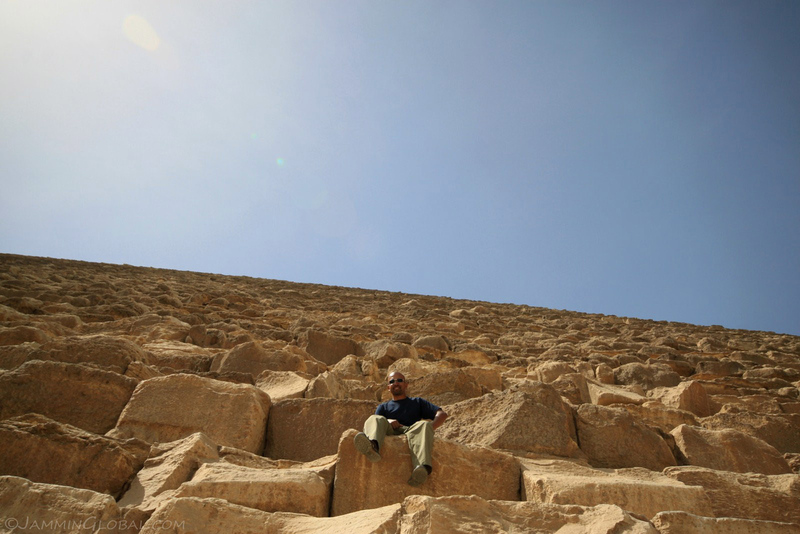 My day on the Giza Plateau was a fantastic experience and I enjoyed traveling back in time, imaging how these very ancient structures must’ve awed onlookers for a good five millennia. Reading about history in books in one thing, but being there and making your own impressions about it is another matter all together. 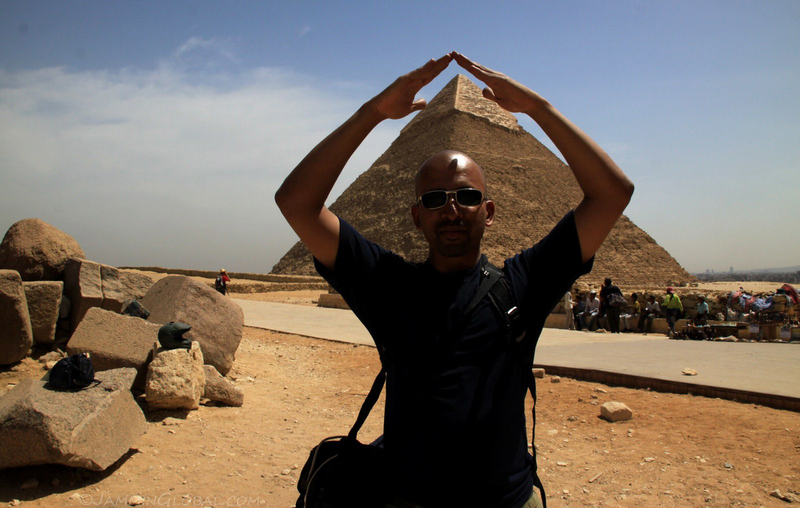 I hope I’ve conveyed some of the grandeur that makes the Pyramids of Giza one of the wonders of the world. And with that, my time in Cairo was finally up. Over the two weeks I spent in the city, I saw its many faces and met many interesting Cairenes, having excellent conversations with them in this tender time of post-revolution honeymoon. I also got many things done and managed to soak in some of coffee house culture there. I got my visa for Sudan, did some good maintenance on sanDRina, explored old souks and mosques and cursed at the traffic. Now, I was ready to head out into the desert and the Oasis Route would take me south. Thanks for sharing the great pictures. You point out that geologist push the age of the Sphinx back a few centuries. That would be around 300 centuries. 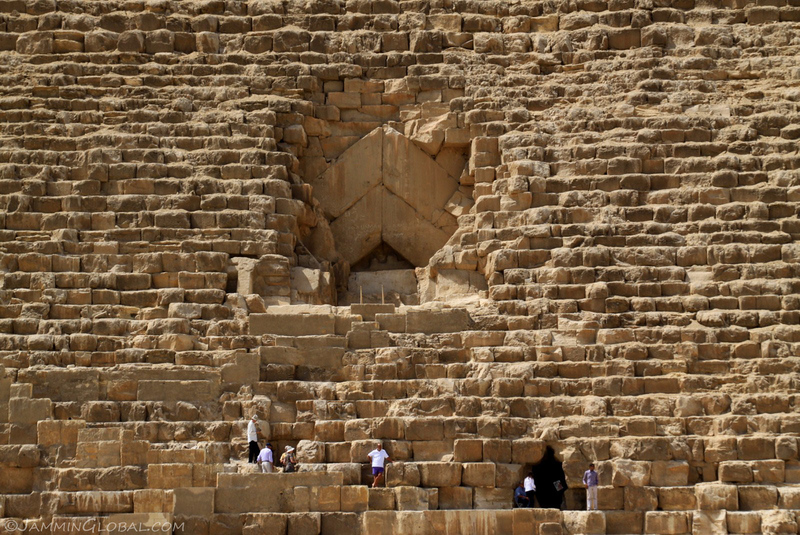 What they mean is the substructure of the Sphinx that matches the walls of the “Quarry”. Anything you saw with the beehive curving lines is a piece of rock eroded by rain, the type of rain you would find in Cambodia. Go back in time to that climate and further to account for that amount of erosion and you will know when those features were cut. Today pollution, moisture from smoke, contains nitrous oxide and carbonic acid which dissolves the minerals between the sand that makes up the rock so it is much softer now. So some look at the stone now and think it can’t be that old because the surface of the stone is so soft. Yet modern pollution is damaging monuments around the world.